Seamless concrete texture skins are one of the easiest methods for giving concrete pattern. If you’re looking for a way to add subtle texture to your new concrete, a seamless stamp pattern is an excellent option. Seamless stamps, or texture skins, impart stone-like texture, but without a pattern. Your concrete will end up looking like one continuous piece of stone rather than many small stones with joints. Seamless stamps can be used on driveways, patios, pool decks and more. In his recent e-book, Concrete Stamping Today, Chris Sullivan states that the trend in stamping is toward larger patterns with finer more realistic detail. One benefit of using seamless stamps is that installation time is quicker than with patterned stamps. Because of their pliability and feathered edges, aligning texture skins is less crucial, which allows the installers to work at a faster pace. However, the drawback is that control joints in the concrete tend to be more obvious since they can’t be hidden amongst a joint pattern. Many contractors also use seamless patterns to create a base texture to which they add hand-tooled joints or custom colors. 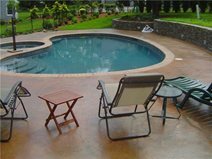 Check out the project examples below to decide if you like the look of seamless stamped concrete. This large 6,000-square-foot concrete pool deck was given a travertine texture and then cut into 2x2-foot squares to mimic travertine tiles. For this spacious patio complete with a pergola and fireplace, a texturing skin in Roman slate was used to stamp the entire concrete surface. 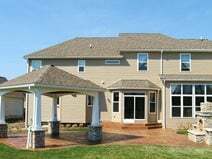 The coloring came from a dry-shake color hardener in a sun-baked clay hue, while the patio was finished off with a saw-cut border along its edge. 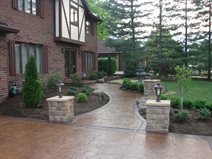 This project consisted of a driveway and matching entry walkway. An old granite seamless cleft stone stamp was used on all 1,500 square feet of concrete. A darker border and bands were added to help break up the expanse of concrete. Many homeowners favor seamless textures because of their clean, natural appearance. This pool deck was stamped with a seamless, continuous-texture Roman slate pattern, with the sawcuts strategically placed in an aesthetically pleasing fashion. One way to dress up a seamless stamp texture is to use multiple colors and border designs. Here the concrete was stamped with a sandstone slate seamless texture skin and colored with two different release agents. The color variation differentiates the border around the pool from the rest of the stamped deck. This pool deck was textured with a seamless slate stamp pattern accented by a random leaf pattern. The rich color comes from an integral Terra Cotta color, a Terra Cotta color hardener, and a charcoal release. 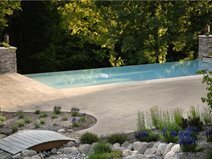 2500 square feet of stamped concrete was installed around this vanishing edge swimming pool. The pool deck was designed with a 6x6 sawcut diamond pattern and stamped with a seamless texture called heavy stone. The diamond pattern serves double duty as control joints and as a decorative accent.